It's fair to say that for most families, the opportunity to spend some time away from home in the sun each year is a must. It's also fair to say that booking a holiday is one of the biggest investments that a family will make each year, so value for money is a key consideration as people seek to make the pennies go as far as possible. Despite that, most people will follow the same old format. Choose a destination, look for a resort, select a hotel and then decide on a date. Get that nailed and then it's just a case of selecting the flights, deciding what board you want and then making the booking. Now there's nothing wrong with that, but have you ever then sat by the pool and thought 'this is nice but I wish there was more to do', or spent a few days exploring and then realised that you've seen everything there is to see and still have half the holiday to go? That’s certainly not an issue that you’d face if you joined the ever-increasing number of people who are looking at the cruise market when it comes to their summer break. Whereas in the past, cruise holidays were very much seen as the reserve of the older clientele, massive investment across the industry has opening up the possibility for families to swap a traditional resort based holiday for a fun-fuelled adventure at sea. The Iberostar Albufera Resort sits on the holiday island of Majorca; a destination that has long been popular with visitors from the UK. Close to the nearest beach and with plenty to keep the kids entertained, the hotel offers three different dining venue, five different bars, an all-inclusive package offering local drinks and spirits through to midnight, local entertainment and a spa. Children can also access a swimming pool, water park and kids club. For a family of four looking to travel in July next year, you can book today for around £1,300pp which in itself isn’t a bad price considering it’s right at the start of peak season. However, when you then compare it to a family friendly cruise at the same time of year, you suddenly realise that it’s possible to get a lot more for even less money. 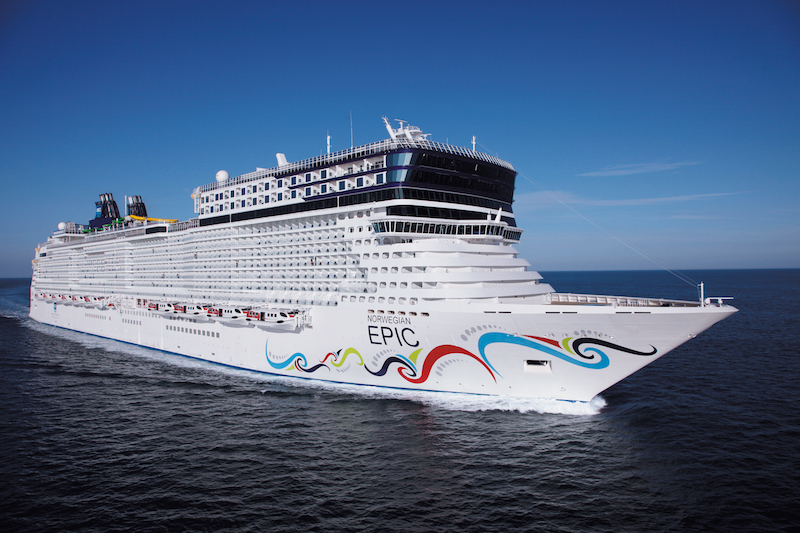 The Norwegian Epic has been part of the Norwegian Cruise Lines fleet since 2010 and underwent a full refurbishment programme back in 2015. Winner of various awards through the years, the ship operates various itineraries around the globe and in late July 2018, will be sailing around the Mediterranean on a seven-night trip from Barcelona. As well as providing the chance to see the sights around the Spanish city, the ship will also head for Naples, Rome, Cannes and Palma over the course of the week; offering the opportunity to explore a number of impressive destinations in one foul swoop. Whilst onboard, there’s the chance to sample dining from more than 20 different venues offering cuisine from around the world, snack bars open around the clock, no fewer than 21 bars and lounges and an all-inclusive package that runs 24 hours and included premium brand alcohol. Entertainment is more wide-ranging featuring everything from Broadway shows to first-rate comedy, with children having access to swimming pools, a water park, sports facilities and a kids club. You’ll also find a spa, casino and gym onboard. Thanks to special deals in place throughout August – which offer reduced deposits but a discount on rooms of up to £200 – a break for a family of four comes in even cheaper than the week in Majorca, despite offering everything that the ‘traditional’ holiday offers, and a lot more besides. It should come as little surprise then to discover that more and more families are exploring the possibilities that a cruise holiday provides. Are you ready to join them? If only ships/boats didn't frighten the life out of me! Am I ready to join them? No thanks! I can see the attraction for families of these sort of big AI resorts - even the floating ones - but it would be my idea of hell. And having cruised on much smaller, adult only ships, on seeing these huge ships in port I've often wondered just how long does it take for everybody to embark and disembark when making ports of call? My idea of hell as well SMa. Ocean cruising has never attracted me, the thought of spending my holidays along side so many people fills me with dread. I have enjoyed the river cruises that I've been on but even then I didn't like being in such close quarters with the hundred or so other passengers. Good job we aren't all the same though, I'm certain many people would be bored stiff with the sort of holidays that interest me. Me too. I'm quite antisocial on holiday. I don't want to see my neighbours sunbathing, nor hear their conversations over the balcony. There's only so many times you can walk around a ship, chose how big it is... And image being on a ship and you get lumbered with someone who is determined to latch onto you or having to suffer their sprogs........crikey what a nightmare. I've seen the cruise ships come into Malaga and the passengers are taken from the port into the city by a fleet of coaches. By 6pm they're taking them back to set sail at 8pm. Can't image they'll see too much of Malaga in a few hours. If the companies are targeting families, I hope that they've got their act together and are employing lifeguards now. I've done a couple of cruises quite a few years ago now , one round the Carribean and the other along the coast of Malaysia , really enjoyed both of them , but both adult orientated . Also done a Nile cruise and that was very good too , the only thing I found was that you're really on the go all the time and it's not very restful or peaceful , the best idea would definitely to add some time on the end staying at a nice resort . Having done over 10 cruises I can honestly say I've never felt 'crowded'. In fact on one cruise with 3000 people hubby and I plus another couple couldn't work out where everyone was, it was so quiet. We decided that as it had been a port day people had gone to bed early exhausted from a full day of exploring! I think its something that people fear- too many people around all the time. I haven't been on a cruise but probably will at some time in the future. I am a bit not sociable at times. I don't particularly want to share a table with others. However, my neighbours decided to give a cruise a go- and they now go every year! I hope I get a pleasant surprise and change my view on cruises and crowds! Babs - that sounds like a great cruise! I loved San Francisco. My husband has steered a ship through the canal! Would love to experience that! I would definitely look at a cruise which wasn't family friendly though! Cruising is a great way of seeing differnt places that you would probably never get to go to, and gives you some idea where you woul like to go back to to do some serious exploring, also places that you may have fancied going to but finding a day there was enough. I have taken my own family and grandkids on a cuises and had a good time however I have also been on a couples cruise at school holiday time and wouldnt want to do that again. I'd also absolutely have a full blown breakdown if the waves were big like what you are saying Glynis. I genuinely would not know what to do. As a parent, the thought of being in an enclosed space with not only my own children but everyone else's sounds like hell. My children are well travelled (one has been to 16 countries, the other to 10). Eurocamp and equivalents have allowed us to experience different cultures at a leisurely pace. My fear of ships stems from years ago when myself & 3 blokes were travelling home for Christmas from Holland where we were working. All was fine & we were happily sitting in the bar when the boat started to rock & sway. Up & down. Side to side. I looked out of the window & couldn't see the sea, only the sky. Then I couldn't see the sky only the sea. The glasses started to fly across the tables as though they were possessed, the curtains started to close & then reopen. Time to leave the bar. Trying to walk was, I must admit, funny, as one of us went to one side of the corridor & another bounced off the other wall. 2 steps forwards 3 steps backwards. Side to side. Up & down. I've been reading a lot of news from Spain lately regarding the good and the bad of mass tourism. The outstanding consensus of those commenting to the various articles (where comments were allowed) is that cruise ships add nothing to the local economy. When you have several cruise ships in port, thousands of passengers are traipsing around, usually in the main tourist areas such as the historical centre, and in a tribal fashion following someone with a placard and a megaphone. When there's several groups their megaphones get louder to be heard by everyone in the different groups. They clog up the streets, they don't buy anything apart from maybe a bottle of water, a coffee and a tatty fridge magnet.....and they make life difficult for everybody else to get around. Someone commented that there were 7 ships docked in Barcelona a few weeks ago. Assuming that they were different sizes and taking an average of 3,000 passengers per ship, that's 21,000 extra tourists traipsing around some narrow streets. Spain registers a record number of 3.6 million cruisers in six months. Ports of the State predicts that by the end of 2017 will add 8.8 million passengers.Spanish ports accounted for more than 3.62 million cruise passengers between January and June, an increase of 1.7% over the first half of last year and a new historic high, according to data released Friday by Ports Of the State. It is expected that by the end of 2017 will reach a new historical high of 8.8 million passengers. The figures show that in only ten years has doubled the number of cruise passengers who passed through the ports of Spain, where in 2007 passed 1.8 million cruise users. According to forecasts by the Port Authorities, by 2020 the number of passengers will rise to more than 9.5 million. By areas, ports located in the Mediterranean accounted for 63.7% of the total number of cruisers between January and June, 2.3 million, with an average increase of 6.64%. By the Balearic Islands passed 754.616 cruisers, 3.45% more; For Malaga 201,904, 18,28% more, and for Valencia 148,964, 7% more. In Tarragona the increase was 557.8%, with 10,413 passengers; In Almería of 119.9% ​​(13,506), and Cartagena of 42.7% (91,801). Canary ports, with more than 960,000 passengers and a national market share of 26.5%, experienced a decline of 8.85% due to the strong incidence of seasonality that causes the months with greater 'pull' to focus on winter. Meanwhile, the ports of the peninsular Atlantic and the Bay of Biscay registered an average growth of 4.7%, to 355,400 cruisers.